“Torn” is the first episode in Season 3 to truly move on from the New Caprica storyline and take us into uncharted territory. The insights into the inner workings of Cylon society are reminiscent of the revelations in Season 2′s “Downloaded,” but this time around we get to see the Cylons in their own environment. All the scenes on the basestar were scored using solo piano, an instrument that has made extremely seldom appearances thus far. 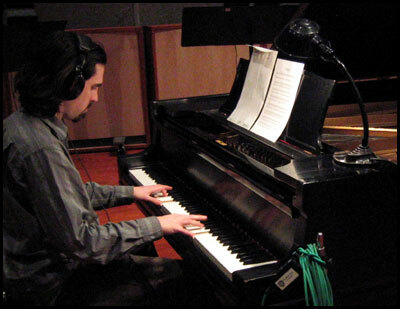 This entire concept began with Ron Moore, who initially wanted to play something unexpected and unusually calm against Baltar’s strange and urgent surroundings. While it sometimes seems that the piano is a theme for the basestar itself, it is in fact a musical representation of Baltar’s fear. During basestar scenes where Baltar is not present, the piano is gone! Whenever possible, I work with the editors to score early cuts of the episodes. With a schedule this tight, it helps to have drafts of the score already in place by the time the picture is locked. “Torn” took this model to the extreme. I scored the earliest version, and ended up writing new music for all subsequent revisions. In all, I scored the majority of “Torn” four times (three times more than any other episode gets!). Solo piano makes a rare appearance on the Galactica score. The piano music went through many changes during this process. My original idea was to incorporate already-established themes into the solo piano tapestry. For example, there was a scene where Baltar finds D’Anna with baby Hera. We realize that in D’Anna’s “projection,” she and Hera are standing in the same concert hall that Baltar envisioned on Kobol in the Season 1 cliffhanger. 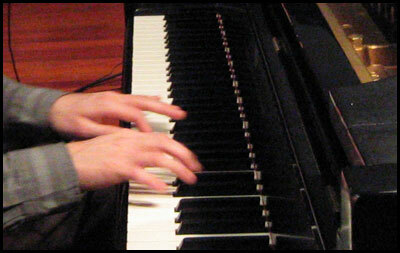 Naturally, the piano shifted into a subtle version of “The Shape of Things to Come” (the score from that scene). Ultimately, the sequence with the baby was cut out due to time restraints and this approach to the score was dropped, though keen ears may still notice statements of Baltar’s theme while he and Six are watching the hybrid. In the end, a new theme was developed for “Torn.” I first wrote a stand-alone sonata movement, without the restraints of scoring to picture. It included the standard components of sonata form — an A section, B section, development and recapitulation of the A section. Once it was finished, I used that material to create the various cues. In this way, I could ensure that the sonata would help give the episode a sense of cohesion and subtle development. As with everything on the Battlestar Galactica score, I’m encouraged to experiment. I’m still not sure if this experiment entirely worked, but it was a fun challenge nonetheless.